Addiction destroys lives and families, hopes and dreams. Addiction is a disease, and everyone hopes for a cure. Why wouldn’t they? A cure is easy; it is, by definition, a one-time event. Who wouldn’t want to take a pill, get a vaccine, or even have surgery if it meant they would never again have to fear that vicious cycle of recovery and relapse? Unfortunately, there is no cure for addiction, and those who promise one are charlatans and liars. In fact, many people relapse because they confuse recovery with cures. When they start feeling better or go a few days without cravings, they think they have beaten their addiction. All too soon, they find it has come back, often with more punch than before. The key to recovery is recognizing that it is not a cure. Recovery isn’t easy. It requires daily recognition of and respect for the power of addiction. It requires an ongoing commitment to living a life in which it is easier to not use. When successful, recovery can keep addiction at bay, reducing it to a feeble voice that no longer sabotages the lives of good men and women. Lasting recovery demands change. The addicted person must think, act, manage his or her life, and express his or her feelings in new, healthier ways. 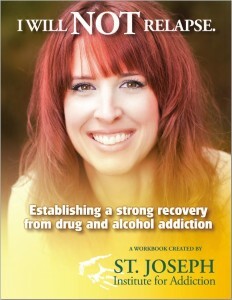 To help the addicted person make these changes and establish a strong recovery, St. Joseph Institute has prepared a workbook: “I Will Not Relapse.“ We encourage you to download this free workbook or contact us for a free printed copy. Our goal is simple. We want addicts and alcoholics to embark on a path of life that looks and feels as good as a cure.